_MAL5674, originally uploaded by Michael A. Lowry. A while ago I shared my mojito recipie, but neglected to include a photo. I shall now remedy that oversight. 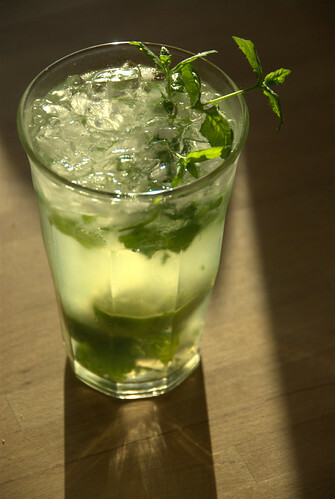 Here's a shot of a delicious mojito I made the day before I flew Massachusetts. Upon arriving on the Cape, one of the first orders of business was to obtain limes, fresh mint, and a bottle of fum. I have also begun to experiment with using brown sugar instead of white when making the sugar syrup. The molassas in the brown sugar adds a nice bit of warmth to the drink. Unfortunately for me, brown sugar is very expensive in Sweden. I suppose this is because most refined sugar on the European continent is produced from sugar beets and not from sugar cane. I'll be packing some brown sugar in my bag when I come back.